This is the ultimate hot-hatch – with the exception that the rear hatch is in the always-open position and beneath it is a 1050cc Abarth four-cylinder engine making about 110 horsepower. This car could take down much bigger and more powerful cars. That much power pushing this little weight makes for an incredibly tossable and fun race car. And this car is race ready. Buy it and go. That little Abarth scorpion logo is good for a few seconds off your lap time. This car was discovered rotting in a backyard in California in 1997 and period-correct Abarth parts were sourced in order to complete the rebuild. Bonhams’ pre-sale estimate is $50,000-$70,000. More info here with more on the sale here. Update: Sold, Bonhams Monterey sale 2012, $30,475. Update: Sold, RM Arizona 2014, $46,750. Update: Sold, Bonhams Scottsdale 2019, $16,800. 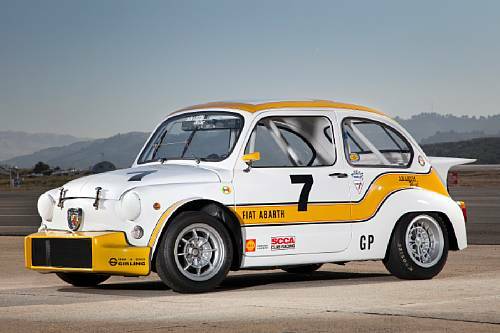 This entry was posted in Uncategorized and tagged 1967, abarth, auction, berlina, Bonhams, classic car, corsa, fiat, race car, tc by classiccarweekly. Bookmark the permalink.